National Park Service: "This is an unmarked kitten of P-39 (approximately seven months old). Mountain lion kittens start losing their spots at around three to five months of age, but in certain conditions you can see faint spots up to 18 months. Can you see some remnants of spots here?" 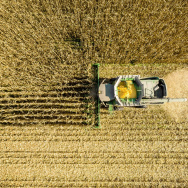 WARNING: Some of the images in this slideshow are graphic. National Park Service: "Mom digs in while one of her kittens looks on. Because biologists estimate her age at only 3-4 years old, it's possible this is P-39's first litter of kittens." National Park Service: "This is the only shot with two kittens in it. It's hard to see, but P-40 (right) has a blue tag in her left ear. We did not place a GPS collar on P-40 when she was captured because of her young age." 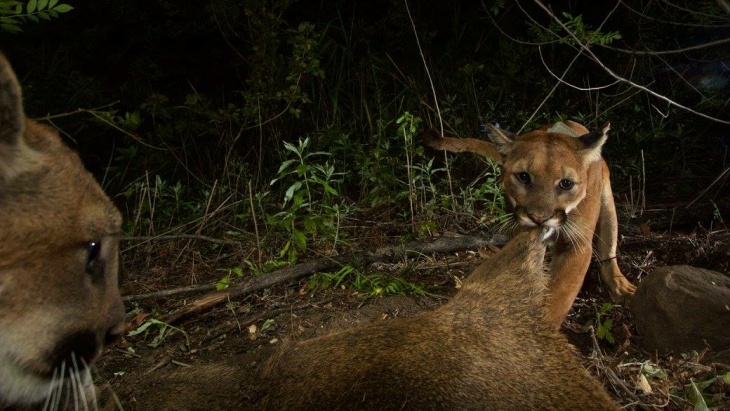 National Park Service: "Our remotely triggered camera captured more than 1000 photos at this location, and this is one of the rare photos with two of the mountain lions actually eating at the same time. In the majority of the shots, they seem to be taking turns." National Park Service: "Unmarked kitten." National Park Service: "Mom works on the mule deer carcass while the unmarked kitten looks on." National Park Service: "Mom licking her lips and taking a break from the meal." 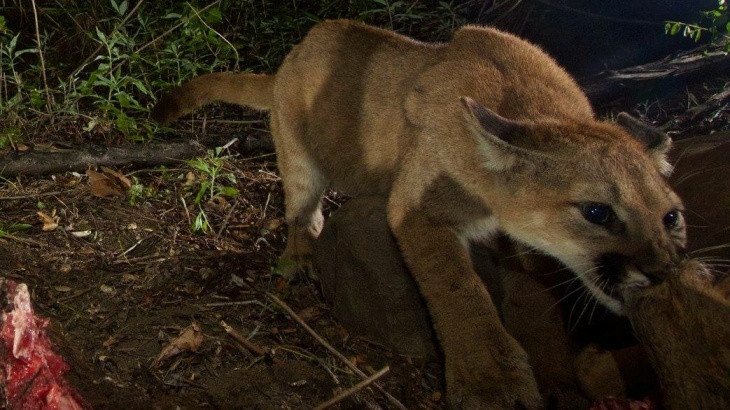 The National Park Service has captured thousands of new photos of a mountain lion and her kittens in the Santa Susana Mountains. 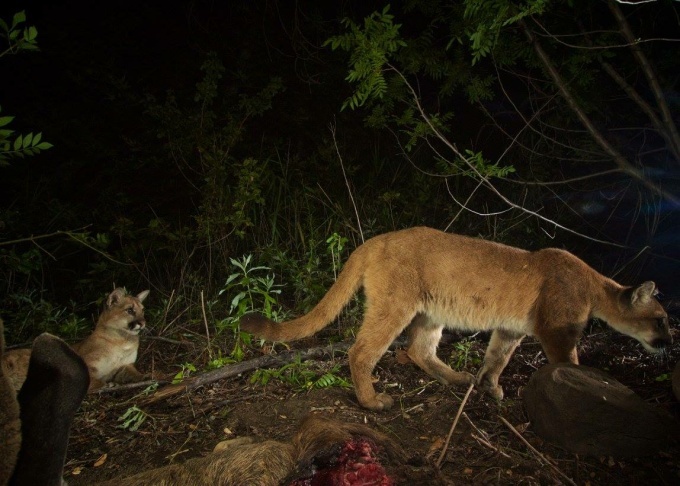 Biologists have been keeping an eye on the female puma P-39 since May and knew she had one kitten, but they were surprised to find at least one and possibly two additional kittens with her, according to Kate Kuykendall, spokesperson for the park service. The photos show P-39 and at least two kittens feeding on a mule deer. You can see some of the photos in the slideshow above (WARNING: some of the images are graphic). You can see more images at the Facebook page of the Santa Monica Mountains National Recreation Area. 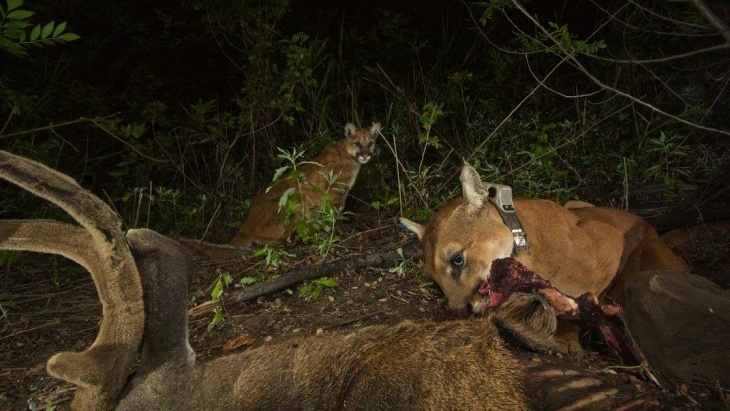 A recent cluster of data points from P-39's GPS collar tipped researchers off that she was on a deer kill, according to Kuykendall. To get the shots, a biologist had to hike up the mountains with 80 pounds of camera gear and manually set up a digital camera in the wilderness. The camera was then remotely triggered at night and snapped thousands of images of the lions. "It's quite labor-intensive, but these photos provide a really interesting window into animal behavior. 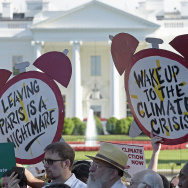 It's just kind of a window into their lives," Kuykendall said. P-39 lives on the eastern end of the Santa Susana Mountains, so she is not quite as isolated as the cougars that live south of the 101 freeway in the Santa Monica Mountains, Kuykendall said. 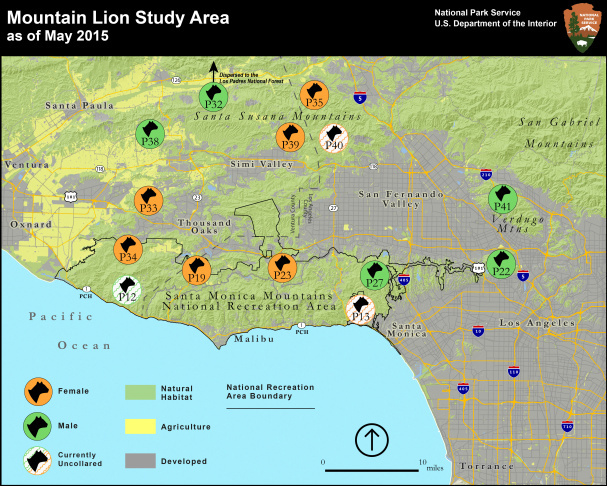 Still, biologists are interested in studying the animals in multiple locations in the region because historically they were part of a larger mountain lion territory, according to Kuykendall. "So one of the things we're really interested in seeing is when these 7-month-old kittens grow up and it's time for them to leave their mom, where will they go? Will they find a new territory out on their own? And that's particularly important for young males," she said. 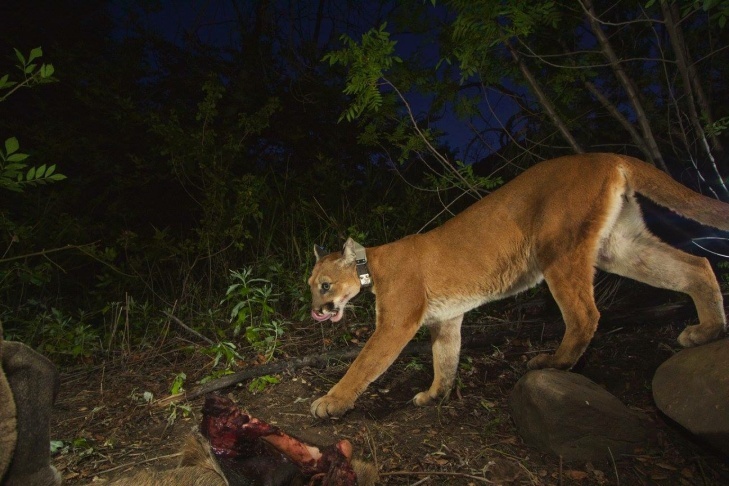 A number of local mountain lions have garnered media attention of late as the park service has used remote camera rigs to capture similar images. 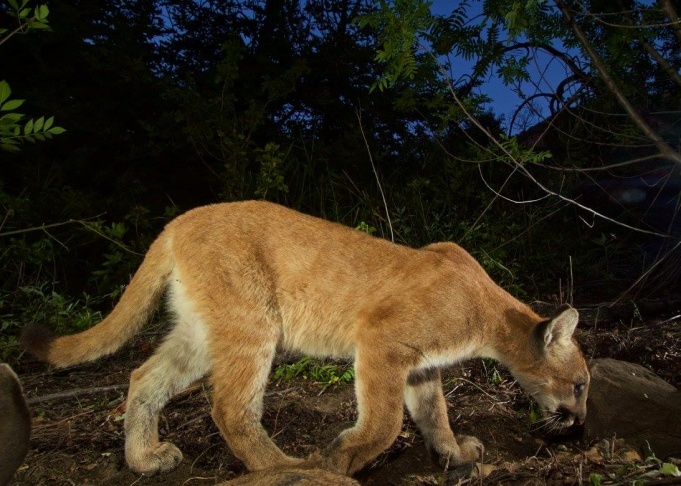 P-22 is one such celebrity cat living in Griffith Park. 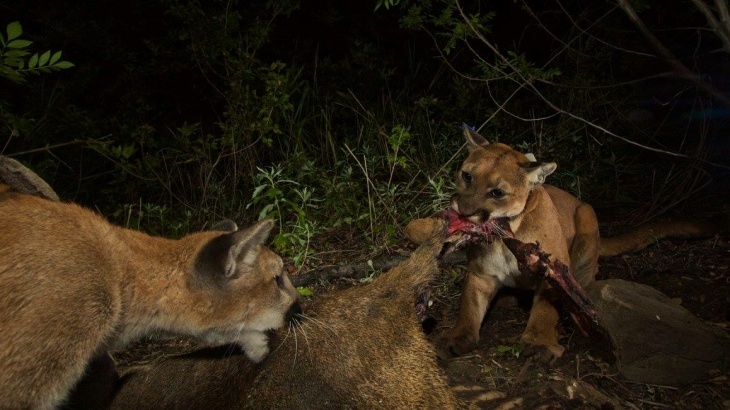 Another male mountain lion, P-41, was recently caught and tagged in the Verdugo Hills north of Glendale, so we're sure to see more photos in the future.